Samsung’s new mirrorless camera touts interchangeable lenses and 4G connectivity. At Samsung’s Premiere event in London last week, the tech world’s collective eye was fixed firmly on the electronics giant’s upcoming gadgets. Aside from unveiling the highly anticipated Galaxy S4 Zoom, Samsung also used the event to show off a bona fide camera – one that isn’t built for making phone calls and taking pictures. 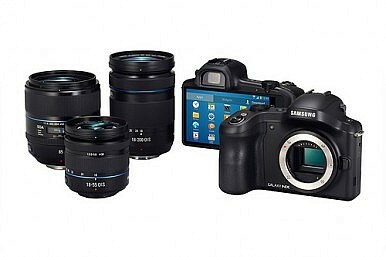 The Galaxy NX Camera is made for photography first, with the ability to instantly share your work an important second. With Samsung sitting atop the smartphone market, some people following its Premiere 2013 presentation simply waiting for new S4 variants or tablets may have overlooked the impressive Galaxy NX. The DSLR-esque shooter is mirrorless and comes with a powerful 20.3MP APS-C format sensor. It runs Android 4.2 Jellybean, so photographers can access all of the apps that an Android-powered smartphone can run (minus the ability to make a phone call). The Galaxy NX Camera also boasts 3G/4G LTE and Wi-Fi, allowing it to be almost ceaselessly connected to social media and the web at large. “Cameras need to be connected, as sharing is such an important part of the whole point of taking photos,” said AnandTech. The original Samsung Galaxy Camera (and its rival Nikon Coolpix S800c – which also run Android) initiated this trend last year, but the camera itself wasn’t particularly capable and the price point was set rather high. There is currently no pricing information on the new Galaxy NX, but the camera appears to be a major upgrade from the 2012 model. The back of the Galaxy NX is almost entirely covered by a sharp 4.8 inch HD LCD touchscreen. If you ignore the viewfinder, it looks just like a Galaxy smartphone in landscape mode (minus a physical home button). Behind the screen, a 1.6GHz Pega-Q quad-core processor provides the brains for Samsung’s new shooter, coupled with 2GB of RAM and 16GB of internal storage. A microSD slot accepts cards up to 64GB. In camera mode, the Galaxy NX offers multiple options that cater to amateur photographers and veteran shutterbugs alike. “Smart Mode” guides users through setting up the camera without requiring any special photography knowledge. The iFunction button, located on the lens, brings up a menu for adjusting manual functions such as aperture, shutter speed (up to 1/6000 sec), and ISO (with a range of 100 to 25,600). Video can be recorded in 1080p high definition at 30 fps. The SVGA digital viewfinder allows for better photo composition, and a proximity sensor shuts off the LCD as you bring the camera to eye-level. A high-tech hybrid autofocus system utilizes contrast and phase detection to zero in on a perfect shot faster and more accurately. Another feature, “Photo Suggest” utilizes your data/Wi-Fi connection to recommend popular photo locations in your immediate area as suggested by other photographers. GPS integration allows for geo-tagging your snaps. The Galaxy NX camera measures 136 x 101 x 56 millimeters and weighs in at 495 grams.